Soleadify - Find Prospects for Your Digital Agency! Never Spend Time Prospecting Again. Ever. Explore businesses that use the technology stack you're most comfortable with. We look for indicators that the businesses lack expertise where you excel! From dentists to e-commerce stores, find businesses in hundreds of categories. Only discover businesses in the cities, regions and states you're interested in. Search for businesses using filters - Location, Industry, Technologies Used and their Digital Shortcomings. Download the business list with all their data and start selling! Make Life Easy for Your Sales Team! Hundreds of Agencies Are Already Using Soleadify. Are you sure you want to wait up on this one? What Type of Businesses Will You Reach Out to? 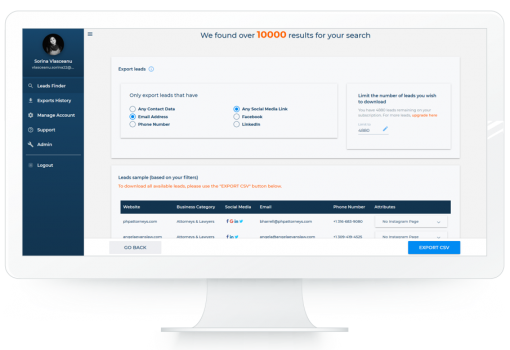 Soleadify helps you find qualified lists of potential customers for your digital services.